Large friendly campground with easy access for big rigs. Pool, club house, paved roads. Located just off the I-75 Expressway between Detroit, Michigan and Toledo, Ohio and is convenient to the many area sights and recreation opportunities. 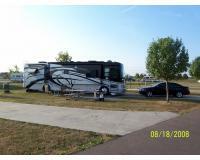 The lovely Monroe county setting is just right for camping near Lake Erie, a pond & creek and landscaped grounds. Longitude -83.39898 / -83º 23' 56"
Latitude 41.88701 / 41º 53' 13"
Easy access for big rigs with pull throughs and slanted back-ins. Paved roads with cement pads with grassy picnic areas. Friendly staff, clean facilities. Fast food and outlet mall across the street. Downtown Monroe 2 miles away. Young trees on site, so no shade but the satellite works great! We would stay here again.